Includes both air vents for liquid and air vents for steam. 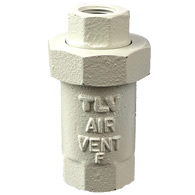 These automatic valves for air removal make use of the same reliable technology utilized in our steam traps. Specialized air vents to remove initial air from pipelines carrying liquids. Air vents to remove air from pipelines carrying liquids. Super compact air vents for equipment. The product line-up includes both air vents for use on pipelines for liquids and those for use on pipelines for steam. The air vents for piping carrying liquids make use of Free Float® steam trap technology for a tight seal and excellent durability. There are two types of air vent series for piping carrying liquids. One features a specialized rapid initial air vent to discharge initial air when the supply of liquid begins, and the other features an automatic air vent to discharge air regularly during operation. The air vents for steam piping make use of thermostatic steam trap technology to discharge not only cold initial air, but also hot air. Rapid initial air venting: Water lifting pumps, fire-extinguishing equipment, water transport lines, water storage tanks. Automatic air venting: Air conditioning facilities, solar systems, water transport lines, water storage tanks. Steam heating equipment such as jacketed kettles. Steam main line pipe-ends, etc.